SCOTLAND. Mary Stuart. 1542-1567. AR testoon. 4.33 gm. 30 mm. First period, 1542-1558. Before marriage. 1553. 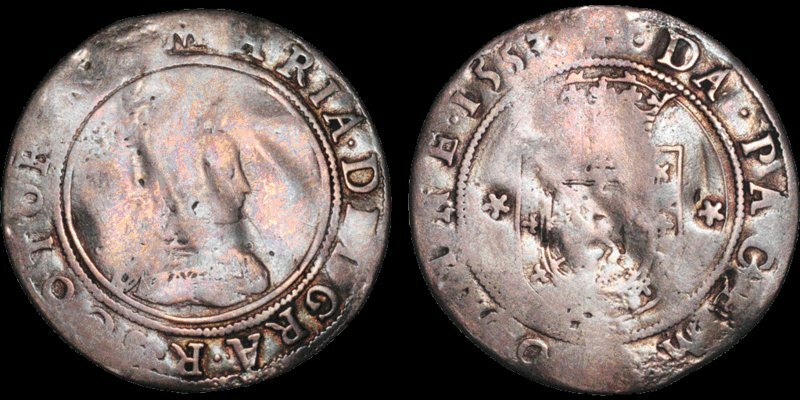 Her young (12 years old) crowned bust right; ★ MARIA • DEI • GRATIA • SCOTORVM around (small O) / Crowned shield, cinquefoil to either side; DA PACEM DOMINE 1553. S. 5401. Burns II, p 270: 1. Pl. LVII, fig. 780. St. 166. Murray (1968 BNJ) Obv C. Rev. 4 (probably). Worn, minor bends, recognizable features. Extremely rare. It was originally thought that this coin was struck in France by the new process of the mill and screw, thus the neat round flan and even strike. (Stewart). Murray (BNJ 1968) disputes this comparing the shallow strike on this piece with contemporary French issues. He argues convincingly that the piece was struck in Scotland. Burns comments on the maturity of the image in view of Mary's being only eleven at the time. Extremely rare; Murray, with great effort, was able to examine (some in photographs only) 18 pieces. He notes "The relief is low and most surviving specimens are considerably rubbed and worn."